Based on reviews from 629 experts and 25,670 users. 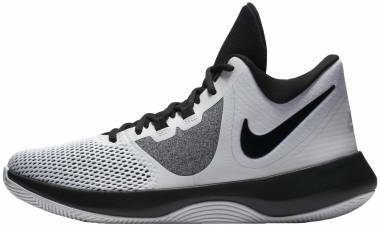 Learn how our rankings work or see our guide to white basketball shoes. Updated Apr 2019. White basketball shoes, or white footwear in general, are popular not only because of their neutrality and neatness but also because of the fact that white is a preferred color by many sports rule books. In the NBA, for example, white has long been the color that every team wear when they play on their homecourt. Because there are rules that say that the colors of an athlete’s shoes must match the colors of his jersey, the influx in the league of the best white basketball shoes from various domestic and international brands is nothing but an expected consequence. While the rules on jersey colors (and basketball shoe colors) have somewhat been relaxed starting the 2017-2018 Season, a white jersey getup is still one of the options that each team has during each game. With this, it becomes very clear that we will be seeing a lot of small and big white basketball shoes in the NBA in the coming years. 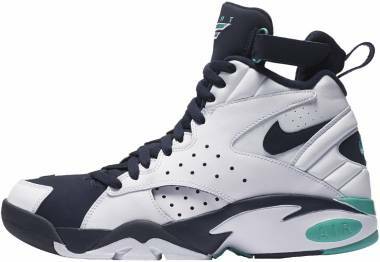 Should you need assistance as to which shoes to cop among the great options that you have, the subsections below present some of the most notable and storied white basketball shoes from today’s major brands. Because white is versatile as far as style is concerned, anything that’s bathe in it will also assume a certain level of flexibility. Hence the shoes presented here are great not only for hooping but also for casual strolls around malls or parks. You can even go to semi-formal events in some. Nike has long been the dominant force not only in the NBA but also in the general shoe market. In fact, an overwhelming majority of NBA athletes are either sponsored by the Swoosh or just have Nike basketball shoes as their footwear of choice. The brand’s hold on the NBA is somewhat solid because they have in their roster some of the most celebrated players in the NBA today: Kyrie Irving, Kevin Durant, and the King LeBron James himself. They also have Kobe Bryant who keeps on making waves in the basketball world even after he finally hanged his famous low-tops for good in 2016. Nike Lebron 15. LeBron James is labeled as one of the athletes who really speak their minds even on the most sensitive of issues such as racial animosity and politics. His conveyance of his messages, however, is not just limited to words and speeches. In one of his games in the 2017-2018 NBA season, LeBron James came out wearing mismatched all-black and all-white LeBron 15 shoes. These Nike basketball shoes have the word “EQUALITY” prominently embroidered on the heel using gold threads, which of course alludes to the royal status of their wearer. These sneakers surely made a statement against racial discrimination, and they were made available to the public on March 2, 2018 through an auction organized by Nike. Nike Kobe AD NXT 360 Infrared. 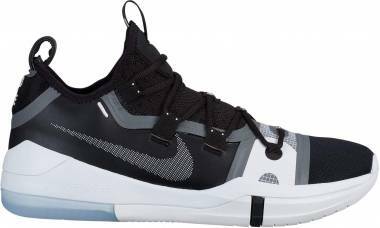 Kobe AD NXT 360 sneakers that are of the Infrared colorway are not really all white basketball shoes. They have orange outsoles that strongly contrast with the neat predominantly white upper. On the heel of the left shoe are four red horizontal lines that symbolize the Achilles injury that Kobe Bryant suffered from in the past. The right has the Stealth symbol that is ubiquitous in the Kobe signature line. Both embellishments are embroidered to the white Flyknit in red thread. The Swoosh on the lateral side is made of a holographic material, adding yet another splash of color to the shoe’s white base. 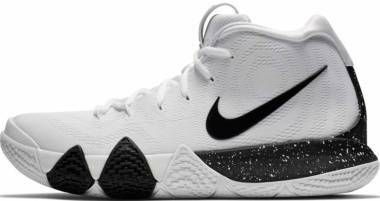 Nike Kyrie 4 Uncle Drew. After an eventful 2017-2018 Season, Kyrie Irving most likely spends the offseason promoting his movie “Uncle Drew,” where he makes his acting debut playing the titular role. He stars in this movie with fellow basketball athletes Shaquille O’Neal and Reggie Miller. This is an achievement for the All-Star player, and Nike is celebrating it with him as together they release the Kyrie 4 Uncle Drew in late June 2018. 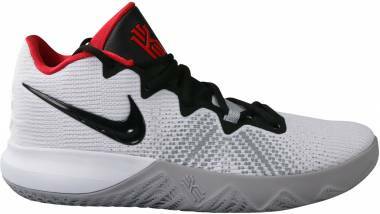 This pair of Kyrie Irving basketball shoes have an all-white upper that is adorned with a blue Swoosh on the lateral side and a blue Kyrie Irving logo on the tongue. The white midsole is embellished with orange and blue specks. Nike PG2. Paul George’s second signature shoe made quite a fuss when it was released in the Playstation colorway. Basketball players and gamers alike were scrambling to get a pair of the quite elusive model. 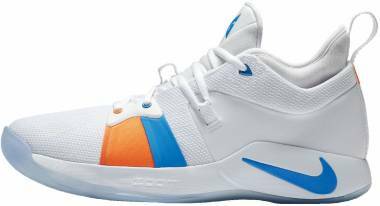 In fact, there were complaints that Nike made available too few of these Paul George basketball shoes. Just in time for March Madness, reinforcement came, but they are already in an NCAA-specific colorway. The predominantly white basketball shoes have a multi-colored outsole. The Swoosh on the medial side and the reverse Swoosh on the lateral side are black with a fish-scale texture to allude to Paul George’s love for fishing. The straps that hold the bottom two pairs of eyelets are also black. Nike LeBron Soldier 12. Those who love white basketball shoes will have two colorways of the LeBron Soldier 12 to choose from. 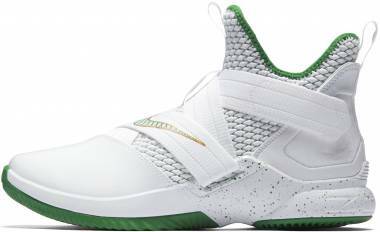 The SVSM colorway is a tribute to LeBron James’ high school. It features St. Vincent-St. Mary High School’s official colors green and gold on a predominantly white backdrop. 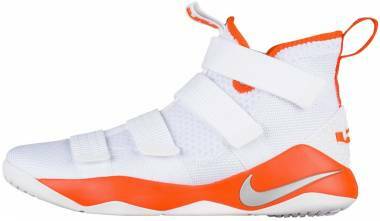 The other colorway of these strapped basketball shoes is referred to as the SFG Witness. It is a reprise of an original colorway of the LeBron Soldier 1, which happens to be retroed at around the same time. The SFG Witness has a white base with navy blue straps, midsole, and heel counter. 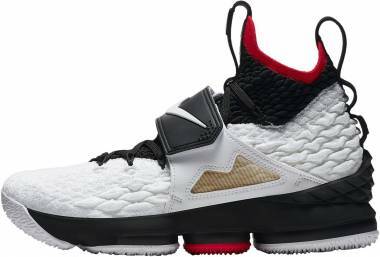 Another interesting detail about these LeBron shoes is the return of the LBJ23 logo on the straps, which has been put to the sidelines after LeBron James’s move to Miami in 2010. Adidas has been making significant strides in both the performance and lifestyle shoe markets lately. Several industry reports show that they’ve been successful at getting chunks from Nike’s market share. According to several analysts, though they still reign supreme, Nike had better start responding with more significant force as the German sports giant is continuously making hits with the technologies and silhouettes that they’ve been releasing as of late. 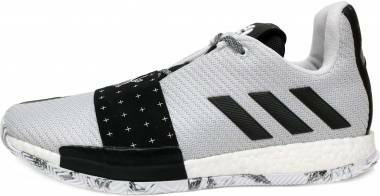 Aware that they still have much work to do to get their rightful spot in the limelight, the Three Stripes made bold moves and signed new basketball players Andrew Wiggins of the Minnesota Timberwolves and Kristaps Porzingis of the New York Knicks. The company is also unrelenting when it comes to innovations and research, and the white basketball shoes discussed below reflect this. 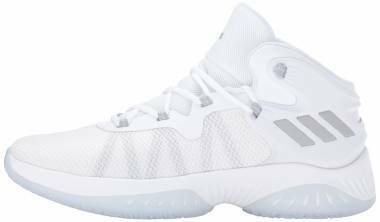 Adidas Crazy Explosive 2017 Primeknit Crystal White. The Crazy Explosive line really lives up to the promises of its name. 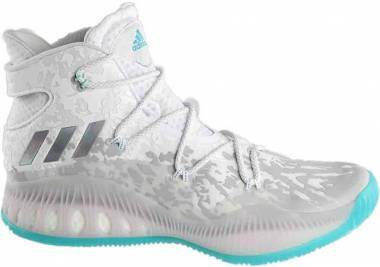 Bearing noticeable technological improvements to the 2016 release, the 2017 version of the Crazy Explosive shoe debuted in two explosive colorways: Crystal White and Light Gray. Each style features a forged Primeknit upper that is characterized by the raised smooth wavy patterns all over it. More than just aesthetics, this wavy pattern also contributes significantly to the shoe’s durability. Adidas Harden Vol. 1. James “The Beard” Harden’s first signature shoe has two versions that will surely be appreciated by those who love all white basketball shoes. The first one, the Harden Vol. 1 Triple White, is an all-white ensemble that features mesh on the upper. The other has exactly the same appearance and composition save for its Primeknit upper. Both James Harden basketball shoes are created as allusions to The Beard’s icy cold rampage against his opponents on the court. Adidas D Lillard 2. 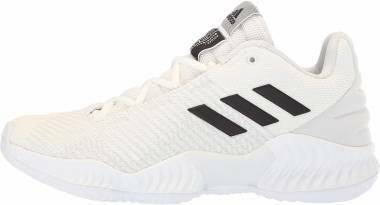 The second D Lillard from Adidas has at least three colorways that have white as their dominant hue. The first one, dubbed Triple White, is an all-white offering that Adidas released as a jubilant tribute to the 2016 All-Star Weekend in Toronto. Another is called the Rip City Home, which is a nod to Portland, the home of Damian Lillard’s Trail Blazers. The last one is a White/Multicolor pair that has a white body. Its black tongue and heel counter is adorned with multi-colored specks. Of course, all three pairs of white basketball shoes still bear the unique Damian Lillard branding elements that made the line so popular. 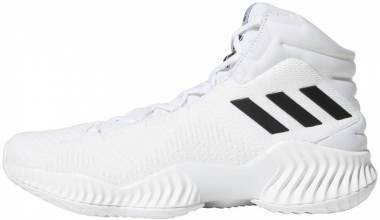 Adidas Rise Up 2 White. The Three Stripes company surely does not turn a blind eye on those ballers who are on a budget. 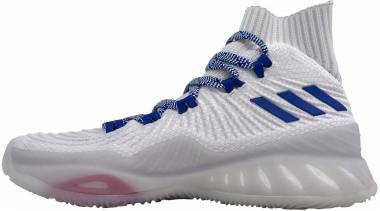 At significantly below $100, the Adidas Rise Up 2 White features an Adiwear midsole and a pillow-like Cloudfoam midsole. 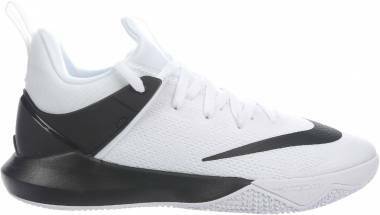 Through these technologies, these white basketball shoes are able to cushion every harsh landing and support even the quickest of movements. This model comes in an all-white form, save for the black Three Stripes on the rear lateral panel. The Jordan Brand has just been overtaken by Adidas as the second most valuable brand in the market today. However, Jordan is not yet ready to give up and is fighting back with recent releases from Russell Westbrook’s and Chris Paul’s signature lines. The brand is also periodically bringing back nostalgic designs from the collection of the legendary Michael Jordan. The kicks also come in a variety of playful colors. Of course, because of their timeless popularity and relevance, the good old white basketball shoes won’t just be set aside. Air Jordan XXXI Low White. The Air Jordan 31 Low gets some design cues from the iconic Air Jordan 1; it just makes significant technological and structural updates to the first Air Jordan so that it fits today’s more fast-paced type of basketball. It has a Flyweave upper that provides a secure close-to-the-skin fit, effectively minimizing slips and unnecessary internal movements. Its midsole setup is enriched with the company’s proprietary FlightSpeed technology, which works to maximize the energy returned by the Zoom Air unit. Finally, its low collar bestows both performance and aesthetic benefits. It allows more range of motion for quick players. Its low-top silhouette also makes the Air Jordan 31 very much wearable off the court. This model comes as all white basketball sneakers that will surely make outfit experimentation such a fun and easy experience. 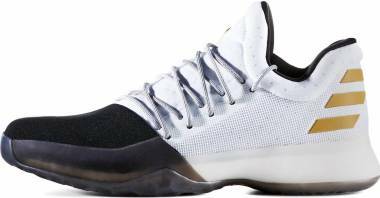 Jordan Melo M13 White/Black/Gold. Carmelo Anthony is one of the most tenured Air Jordan athletes today. Technically the fifteenth release (two of the models before it had limited special releases) in the Melo line, the Melo M13 comes with technologies that provide unparalleled comfort, explosive energy returns, and secure foot containment. The soft mesh used for the upper generously delivers next-to-skin comfort and flexibility. The wearer’s first steps and jumps are sufficiently fueled and then effectively cushioned by the FlightSpeed system in the midsole. To make sure that the foot stays in place, the upper has the Flight Web fit system. The Jordan M13 comes in the White/Black/Gold colorway. A gold Jumpman logo is placed on the rear lateral side of this white basketball shoe’s upper. The midsole, tongue, and the outline of the collar are black. Jordan CP3X.AE White/University Red/Midnight Navy. Considered a toned-down version of Chris Paul’s CP3 10, the AE still has the exact same technologies as the original—a woven mesh upper, a responsive Zoom Air unit in an Injected Phylon foam carrier, and a research-backed tread pattern. It just gets rid of the large TPU panel on the lateral side. The white colorway of the CP3 10 AE boasts an all-white upper that is disrupted only by the midnight navy collar outline, blue Jumpman on the rear lateral side, and blue lace loops that are held in place by red strings. The midsole of this Chris Paul basketball shoe has a single university red stripe at the heel. 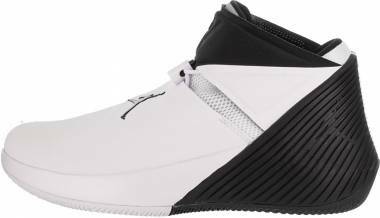 Jordan Ultra.Fly 2 White/Black/White. Just the second release from its line, the Ulta.Fly 2 from the Jordan Brand already sets expectations high with its plush cushioning, updated tooling, and very nice fit. The Zoom Air units at the forefoot and heel, while all good and responsive, keeps the ride low, ensuring for the wearer a sufficient amount of court feel. The second Ultra Fly also has a webbing lace-up closure that ensures that the foot is securely and safely locked down. 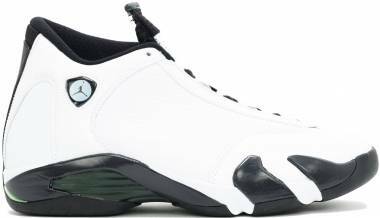 These Jordan basketball shoes resemble the Air Jordan 15, which is known for the protrusion of the upper part of the tongue. 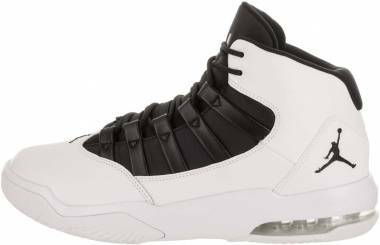 The White/Black/White colorway of this model would have been all white basketball sneakers if not for the black lace loops and black Jumpman on the rear lateral side. Jordan Fly Unlimited Triple White. 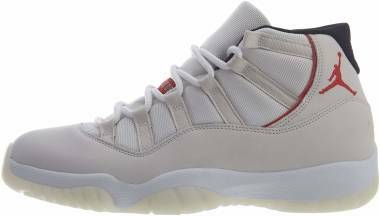 The Jordan Brand has always been known as a producer of not only great on-court performers but also fashionable kicks that wearers can surely rock on the streets. 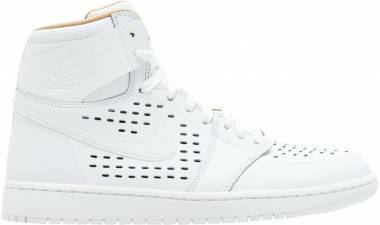 The Jordan Fly Unlimited Triple White offers the best of both worlds with its slim form and effective technologies. Its light and figure-hugging upper is made of textile and mesh. It provides a good amount of flexibility and support. This shoe has Phylon and Zoom in the midsole for explosive energy return and plush cushioning. A unique multidirectional pattern is featured on the rubber outsole. There is no doubt that Stephen Curry played a very important role in bringing Under Armour to prominence in basketball. Yes, UA is a force when it’s about sports shirts and other similar apparel; but when it comes to basketball shoes, the brand is practically obscure. Well, to be fair, Steph Curry himself was also an often overlooked underdog. One would recall that Steph has been an underrecognized athlete when he was still with Nike. In a way, both parties were actually taking chances with each other though they both had very positive outlooks for the future. Under Armour Curry 5 Takeover Edition - White. 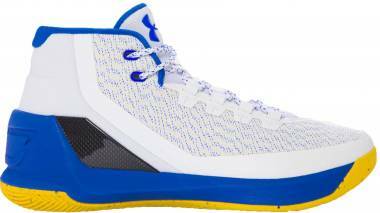 Under Armour released 314 pairs of the Curry 5 on Pi day March 14, 2018, which also happens to be the thirtieth birthday of basketball star Stephen Curry. As they turn to mathematics to get ideas on how to craft the revolutionary fifth Curry, the designers of these Stephen Curry basketball shoes are drawn to the Pi and the perennial Greek problem of squaring the circle. 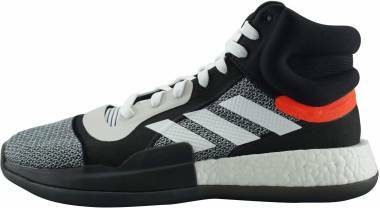 The result is now what many consider as one of the most innovative basketball sneakers to have ever come out of the company’s factories. The fifth Curry shoes from Under Armour are released in several colorways, including the Takeover Edition - White. These white basketball shoes have gold accents in prominent areas at the back and front. Under Armour Curry 4 All Star. Stephen Curry is the captain of one of the two teams that battle it out during the 2018 All-Star Game in Los Angeles. To mark this rare achievement in Steph’s career, Under Armour laces him up in a special version of the Curry 4. The shoe went through a thorough makeover, and it now boasts an all-white upper and an icy blue iridescent outsole. These pristine white basketball shoes pay tribute to the City of Angels as this year’s All-Star host. The immaculate but head-turning white appearance of the shoe is also said to be a significant nod to Steph Curry’s dual personality on-court. 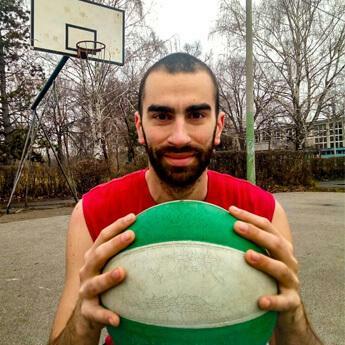 His ability to neatly drain threes even from afar makes him such a threatening scorer while his relatively high basketball IQ makes him such a commanding leader. Under Armour Heatseeker. A mid-top basketball shoe with a one-bootie construction, the Under Armour Heatseeker does its job of supporting the foot well during hard cuts and quick direction changes. To further enhance the comfort that it delivers, a neoprene sock is integrated in its structure. This sock is where the laces are anchored. The midsole has the same tooling as the Drive 4; it has EVA and Micro G that provide comfort and energy returns all throughout the game. 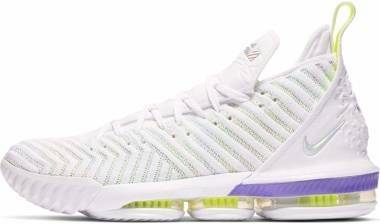 The UA Heatseeker is available in at least two dominantly white colorways. The first one has gray accents while the other has midnight navy accents. Under Armour Charged Controller White/Phoenix Fire/White. Released at around the same time as Stephen Curry’s third basketball shoes, the UA Charged Controller is often thought of as the Curry 3’s low version. This is such an easy mistake to make especially that both shoes have Threadborne uppers. This material is known for being lightweight while being sturdy and flexible. The midsole is a direct lift from the setup of another UA shoe: the Drive 3. It features a combination of Micro G and Charged that ensures highly energized steps. The UA Charged Controller debuted in at least two colorways, and one of which is a white pair with hints of orange, which is fancily referred to as Phoenix Fire, at the back. Under Armour Get B Zee White/Black. Micro G and Charged have been proven to be effective in cushioning and energizing the wearer’s every step. 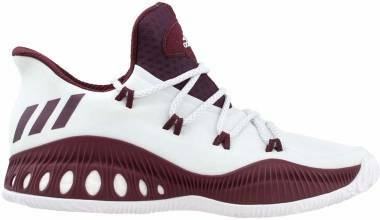 As a direct consequence, these technological duo are featured in the midsoles of a good number of Under Armour basketball shoes, including the UA Get B Zee. This playfully named shoe has a textile upper that is overlaid with perforated leather for breathability. This is available in a number of colorways, including a white one with black accents. White: What Does It Stand For? White is probably the most popular color as far as clothing is concerned. In fact, almost every item in department stores has a sought-after white version. The list of explanations why this is so is surely long, but white’s neutrality is certainly on top of that list. Aesthetically, it’s so easy to the eyes because it doesn’t stand out too much nor steal so much attention from anything that is near it. Practically, it’s such an easy color to handle. Those who are always in a hurry will truly appreciate white because it is so easy to match with any colored piece. It goes well with blue denims, khaki shorts, cargo pants, and the list just goes on and on. In the NBA, every team has a dominantly white jersey. This used to be referred to as each team’s “Home” color because it’s usually worn by players when they play on their homecourt. But the 2017-2018 Season changes this. Every team now has an ensemble that is called “The Association Edition.” It is unclear why it has the name that it has. It can be speculated, however, that this is most likely because white is the only color that’s common to all teams; it makes sense to use it to tag the teams as members of only one association called the NBA. Using white basketball shoes on any court is not going to be a problem. As mentioned in the introduction, white is among the few colors explicitly preferred by several sports rule books. However, it is not a secret that all white basketball sneakers will be used in other contexts because of the neatness that is inherent in them. Because of this, it might be useful to take note of the meaning that some people ascribe to this color beyond the court. Generally, white is a symbol for peace, virginity, and many things pure and desirable. Because of this, it is usually worn in such occasions as weddings, baptisms, and even job interviews to denote sincerity and purity of intentions. There are cultures that associate white with mourning and grief. In these cultures, white is common in funerals and any other practice or observance that has something to do with death and/or rebirth in another world. White is also associated with safety and parsimony. People with this mindset might consider the wearing of white as an allusion to relaxation and being basic. The best white basketball shoes look immaculate and radiant especially when they are new. But they are basically just as delicate as they look, and an obvious not-so-good consequence of this is that they get dirty very easily. It is very important to know how to take care of them, and the ultimate first step is to avoid getting them dirty in the first place! There are many ways to do this, and one is to not wear them to just every event that you attend. Limit their appearances to just the ones that matter the most. Choose your battles, they say; and this should be applied to delicately white basketball shoes. Fill a bowl halfway with cool water. Mix in a little dish soap, probably just a teaspoon, and stir well until the light detergent is thoroughly diluted. Insert a balled up cloth into the dirty shoe; it not only absorbs any excess moisture, it also provides the necessary resistance as you work your way on the shoe’s soiled exterior. Dip a clean washcloth into your solution. With the moistened cloth, rub away the stains on the sneaker; increase pressure as necessary but never to the point that you start poking holes in the upper. If the dirt is really stubborn, you may want to put down the cloth and equip yourself with a stronger weapon: an old toothbrush or a new one with soft bristles. Dip the brush into your solution and start brushing the dirt away. When you are already satisfied with how clean the shoe is, pat it dry with a soft and clean piece of cloth. Pretty much what we all do when get out of the shower. Leave the shoe in the open air to dry. Knowing how to clean anything is never our license to just keep getting them dirty all the time. Remember, just like any other piece of clothing, each wash reduces a bit of the white basketball shoes’ quality, no matter how careful the process is. How can I get white basketball shoes for sale? Just like any other product, white basketball sneakers are at their most expensive when they’ve just been released. The hype and demand for them at such times is high, so the high price is just a natural consequence. Law of supply and demand anyone? If we are to be practical and all stingy, then the release time is not really the best time to buy shoes. Discounts start coming in when the release date of the next big thing, or the shoe that will ultimately “outdate” the shoe that we are targeting, is announced. Sellers at that point will want to clear up their shelves so that they can accommodate the new product. This is now the right time to get our hands on some white basketball shoes for sale. 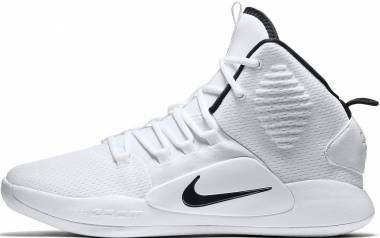 Aside from the companies discussed, are there any other manufacturers of white basketball shoes? The short answer is yes. Very recently, a handful of Chinese brands entered the US market. In fact, they’ve already signed NBA stars such as Klay Thompson (Anta), Dwight Howard (Peak), and Dwyane Wade (Li-Ning) to promote their interests at home and also in the United States. Generally, their products are well-received by Stateside reviewers and users alike, and they’ve become cheaper alternative to the normally costly kicks that we’re used to. German brand Puma has also just re-joined the basketball fun. It can be recalled that the brand withdrew some time ago due to the immense difficulty that they had to endure to make decent sales, let alone get to the top. But now that they’ve hired big names such as Rihanna and Jay-Z to provide creative direction to a number of their would-be lines, the future can really be exciting and surprising at Puma. Of course, let’s not forget about Reebok, which never really let go but just not making a lot of noise. It has Shaquille O’Neal and Allen Iverson on its (probably) lifetime payroll, so there is a possibility that some of the best white basketball shoes in the coming months or years will come from this brand. Are all-white basketball shoes still considered stylish? Yes. In fact, anything white never really goes out of style primarily because they blend in so well with whatever it is that causes the new frenzy. There’s a reason it’s used as a symbol of peace and harmony, you know?